My course on irrationality and foreign policy is now wrapping up with a couple of case studies, one of which is the First World War. Tsar Nicholas II’s decision to order a full mobilization of his army in July 1914, turning a local conflict between Austria-Hungary and Serbia into a Europe-wide war, was such a bad one that it defies easy explanation. The Russians ended up in a war they did not want mainly because once they had decided that war was possible they were more concerned with not being at a disadvantage than with preventing it. As Christopher Clark has shown in his book The Sleepwalkers, European leaders were well aware of the scenario in which troubles in the Balkans could lead to a wider European war. Because Russian leaders knew that an Austrian attack on Serbia could escalate into an Austro-Russian war and from there into a broader European conflict, when they heard that Austria-Hungary had declared war on Serbia they assumed that Austria wanted such a conflict. From this point on, Russian leaders were in what psychologists call an ‘instrumental’ mindset: that is to say they were no longer concerned with whether their policy was a good one, but rather with how best to implement it. Russian intelligence had obtained Austria’s war plans, and was aware that if Austria mobilized against Serbia, it would also secretly mobilize its forces on the Russian border. Austrian actions therefore meant that Russia had to mobilize as well, lest it be taken by surprise. The Russian Council of Ministers thus began the countdown to war by recommending to the Tsar that he order a partial mobilization of the army to cover those districts close to the Austrian border. An important assumption at this point was that Austria would not act without German permission. If Austria had declared war on Serbia, that must mean that Germany was seeking war with Russia. This required a robust response if Russia was to be kept safe. The Russian General Staff insisted that a partial mobilization was impractical. If there was to be war, Russia had to be fully ready. The Quartermaster General of the Russian Army, General Danilov, pressured the Chief of the General Staff, General Ianushkevich, to persuade the Tsar to order a general mobilization. Eventually, and with great reluctance, the Tsar conceded. What was wrong with this logic was that Germany didn’t in fact want to fight Russia. But a Russian mobilization meant that Germany had to mobilize too, and once it mobilized, its plans required it to attack France. In this way, the Russian decision ensured that the trouble in the Balkans would not be localized. By acting to maximize its advantages in the case of war, Russia made war certain. The Roman strategist Vegetius famously remarked: ‘Si vis pacem, para bellum’ – ‘If you want peace, prepare for war.’ This advice is much loved by modern-day foreign policy hawks, who endlessly stress the need for high defence spending, and robust policies. The Russian experience in July 1914 proves Vegetius wrong: if you prepare for war, war is what you will get. I have been away for a few days at a conference, thus the lack of posts. Meanwhile, I recommend this article entitled ’10 charts that explain Russia’ by Mark Adomanis. The charts speak for themselves. Seventy-two years ago this week, on 22 March 1943, auxiliary police of the German-controlled Schutzmannschaft Battalion 118 massacred the inhabitants of the Belorussian village of Khatyn. 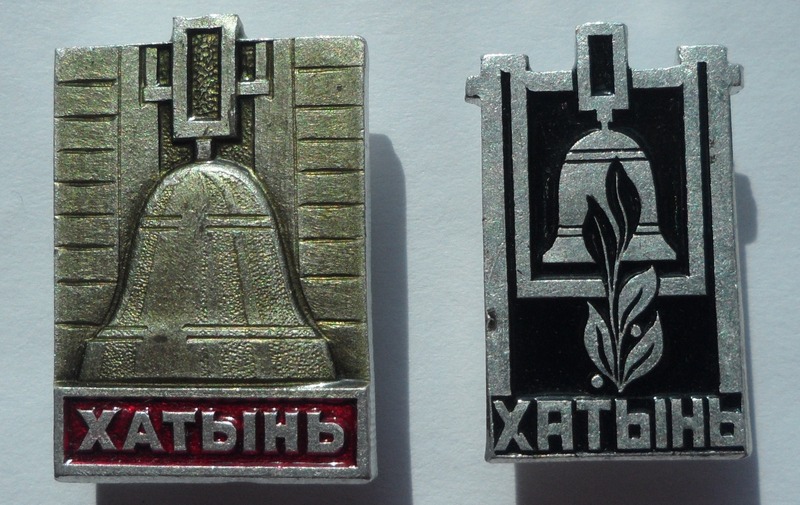 This week’s objects are two badges which I bought at Khatyn when I visited it in 1987, while a student in Minsk. When the Germans burnt down Belorussian villages, all that normally remained of the houses was the chimneys. At the Khatyn memorial complex, bell towers represent the chimneys, and the bells ring every 30 seconds to recall the dead. Under ‘Play Here’ press on 24 March and 10:00 pm, then drag the bar under the play and pause buttons to the 1100 minute mark, and listen away! It had long been planned that the site in question would be used to construct a new building for the Federal Court, to be known as the Pierre Elliott Trudeau Judicial Building. Trudeau, of course, was the father of the current opposition leader, Justin Trudeau, and is much hated by the ruling Conservatives. Although the memorial is a private project, the Federal Government has pledged $3 million in support, as well as giving the land, worth at least $1 million. The design is huge and ugly. Ironically, it is just the sort of brutalist, concrete monstrosity that the communists used to construct. The memorial lacks the connection to Canada normal for public monuments in the country’s capital. Monuments shape how we view our past. They are always political, whether deliberately or unwittingly. The zeal which Canada’s Conservative government is showing for the memorial for the victims of communism is indicative that it endorses the politics of this memorial. But what are these? In the first place, remembering the victims of communism serves to perpetuate the Cold War division of the world into bad guys (communists) and good guys (us). It reinforces the West’s sense of moral superiority, and thus justifies contemporary political action in support of Western goals. If I may be excused for sounding all Gramscian, it is part and parcel of the maintenance of Western hegemony (which is, or is not, a good thing depending upon your point of view). The fact that the Conservatives wish to memorialize the victims of communism, but not the victims of capitalism, or imperialism, is no accident. I think, however, that there is more to it than that. The private group promoting the memorial is Tribute to Liberty. Its Board of Directors contains leading members of the Canadian communities of Poles, Ukrainians, Latvians, Estonians, Czechs, and Slovaks, but no Russians. Russians probably suffered more from communism than any other nationality in Europe, but they are not represented. They are, it seems, not the victims but the guilty party. As one article about the memorial puts it, ‘The announcement [of the winning design for the memorial] comes at a time when Russian authorities have ramped up a campaign to sanitize Soviet history including denials of the violent occupation of former Soviet republics, including Estonia, Latvia, Lithuania. Russia’s occupation of the Finnish former eastern province of Karelia continues through to the present day.’ For some, it seems, the memorial is as much about keeping people angry at the Russians as it is about its alleged subject. Eastern Europeans did not for the most part choose to live under communist rule, but millions of them did participate willingly in communist institutions. The police services of Poland were run by Poles; those of Hungary by Hungarians; and so on. The Soviet Union owed its existence to the revolutionary action of the Latvian riflemen; its leaders included a Georgian (Stalin) and several Ukrainians (Khrushchev, Brezhnev, and Chernenko). Yet this is not how Eastern European nationalists view the history of communism. Rather it is seen only as something imposed upon them by Russians. This memorial to the victims of communism helps to re-write history to reflect that point of view. This week’s objects look like 1920s constructivist porcelain from the Soviet Union. In fact, they were produced by Villeroy and Boch in the 1990s. The artist is Wladimir Njemuchin.